So I've now joined the world of iPhone users and I'm starting to wonder what all the fuss is about. 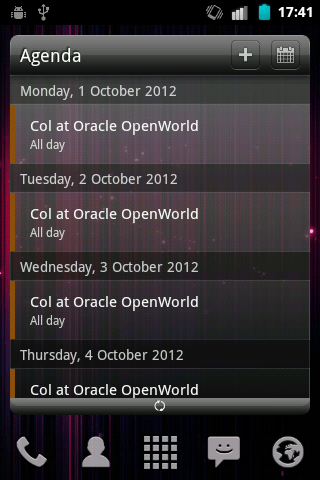 As I'm going to Oracle OpenWorld at the end of the week, my director suggested I get a company phone so I don't incur roaming charges on my personal phone whilst I'm out there. He thinks it'll also come in useful in my normal day-to-day job. Me thinks I may have just sold my soul to Larry Ellison by accepting the phone. Anyway, I got a choice of phones: the Blackberry 9790 Bold, the HTC One V and the iPhone 4 8GB. I wouldn't touch a Blackberry with a barge pole, I'm not a fan of HTC phones and as I've already got an Android phone, and haven't had an iPhone before, I decided to jump for the iPhone. It arrived in all its glory in a really small box on Tuesday last week. I have now had a week to play with it and I really don't know why some many people go mad about the iPhone. This is my view based on coming from an Android phone to an iPhone. The iPhone interface is starting to look very dated. The iPhone interface looks just like my first generation iPod Touch running iOS 4. It originally came with iOS 3 which looks no different to iOS 4. So I think I can safely say iOS 6 looks just like iOS 3 which was released nearly 3 years ago. In that time Android has released 5 different versions of Android, all with noticeable different interfaces. As an aside, I believe Google may be onto a winner with 4.1 (Jelly Bean) - it looks great on my Nexus 7. How do I put widgets on the homescreen? I can't. How do I change the colours? I can't. How do I limit the number of icons on the homescreen? I can't. How do I change my ringtone to a custom tone I've got in ogg format? I can't (got to convert to MP3 first). How do I change the infantile looking appearance of the native "Messenger" SMS app (the "bubbles" are childish) to something that looks more professional? I can't. And I can't replace it with another fully functional app either. The physical appearance of the phone is pretty slick, in two senses of the word: the phone looks really good, but it is also incredibly slippery with dry hands. Before getting a grippier cover for the back, I found the phone slipping out of my hands and off the side of the sofa and other smooth surfaces. Of course appearances aren't everything. It's also a lot heavier than my Samsung Galaxy Ace, but that isn't surprising given the Samsung is mostly plastic and the iPhone is mostly glass and metal. ... both of which aren't too surprising given the Samsung Galaxy Ace is an entry level phone that cost me about £100. A better comparison would be with something like the Samsung Galaxy SII or SIII, but I don't have one of those and can't afford one of those either. That said, had the Samsung Galaxy SIII been on the list of allowed phones, I wouldn't have thought twice. I'd have gone for one of those at the blink of an eye, and still would if someone offered me one for free. So in summary, I'm not entirely sure why everyone is still going mad about the iPhone. I can understand people being excited when it first came out as it was worlds apart from what was currently available, but now I can't help but feel it's fallen behind equivalent Android phones and is riding on the excitement Apple's marketing team and fanbois whip up each time Apple sneezes. To me the iPhone is just a heavier, thicker version of my iPod Touch with the added ability to make calls and take photos. As my director said: "The iPhone is a consumers phone. The Android is a hackers phone." I'm not likely to hack it. Had I got a Android phone, I would have rooted and hacked it moments after it was out of the box. I know I can root the iPhone, but I probably won't. 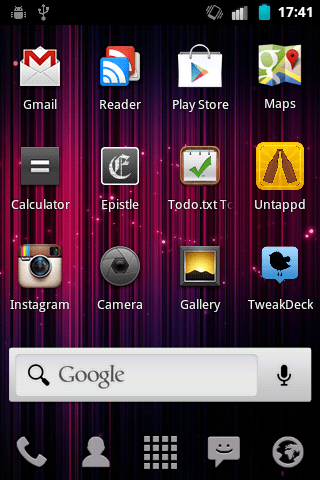 It gives me exposure to all those "must have" iPhone apps people continually rave about that you can't get on Android. So will I ever get an iPhone 5? Probably not. iPhone 10 will probably be out with its 10 rows of icons before my work phone is due for renewal. Unless Apple came up with some radical design (and ethos) change (let me do what I like with my device), I don't think I'd get another iPhone.